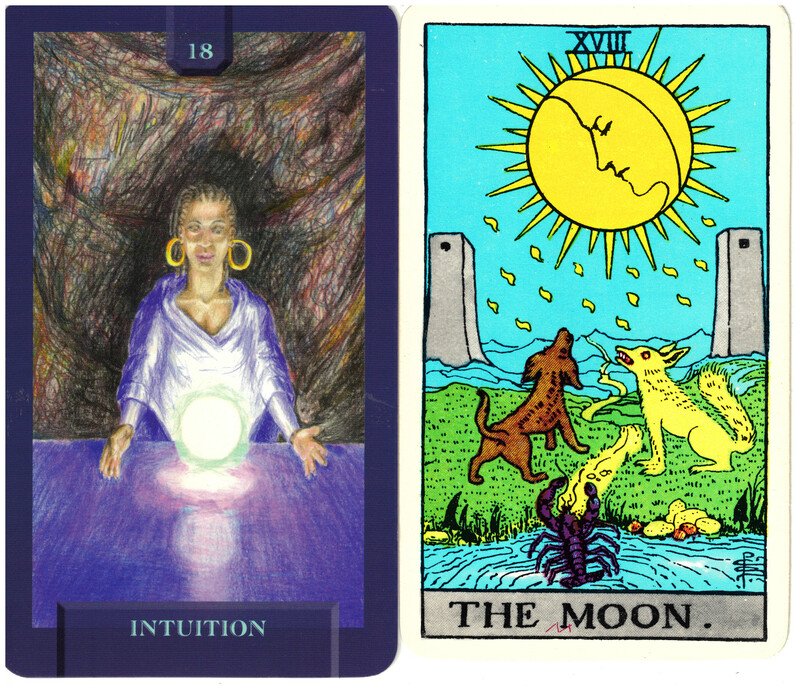 The Moon card from the traditional Rider/Waite/Smith deck is profoundly symbolic. It was a difficult card for me to learn. I could easily understand that the moon represents the shadow aspects of us – intuition, dreaming, psychic powers and imagination, but the rest of the symbolism escaped me. Besides the moon in her three phases (and a rather predominant profile) we also have a violet crayfish crawling out of water, a yellow wolf and a dog that is baying at the moon, two pillars, and droplets falling from the sky. There is a path that leads from the water between the animals, and between the pillars and into mountains far into the distance. While all of the meanings associated with the symbolism are fascinating, what a reader needs to know is the basic meaning of the card and what it would mean if it fell in a reading. Expanding Dimensions, the creators of Today’s Journey Tarot chose to show a glowing crystal ball for this card and a reader scrying its wisdom. This goes right to the point of the mysterious and unknown path we must take to bring the intuitive aspect of ourselves into the light and use that perception in everyday life.